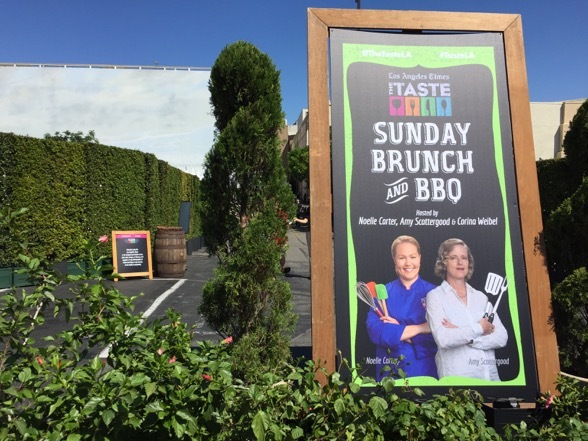 I arrived for the Sunday morning session, which promised brunch and BBQ — two things that are clearly in line with my personal fitness goals. 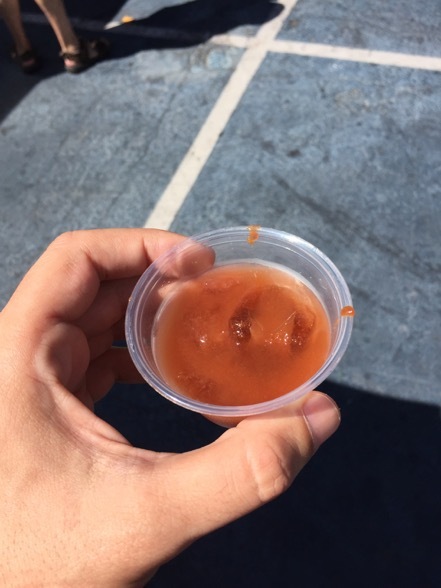 My first stop: a Bloody Mary, courtesy of a vodka company called… called… okay, fine. I don’t remember. The whole point of the Bloody Mary was to get my brain working, and clearly it wasn’t ready yet. 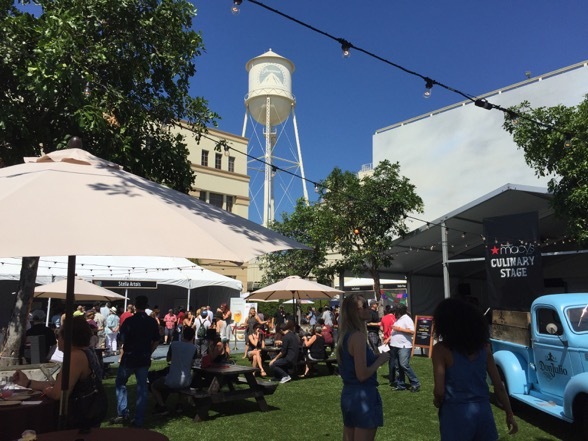 People eating in the shadows of Paramount Studios’ famed soundstages. 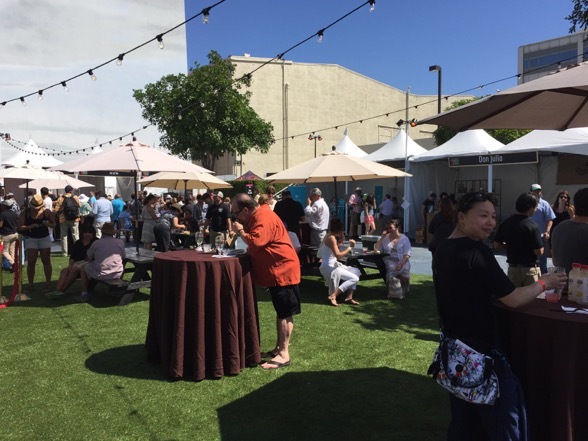 Of course, “shadows” is purely metaphorical as it was aproximately 167 °F and there was hardly any shade in sight. 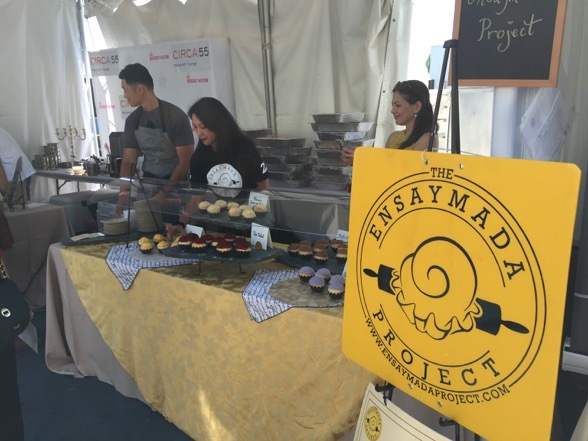 The Ensaymada Project was one of my favorites from last year; so I had to return for more Filipino pastry indulgences. Naturally, I took no photos. 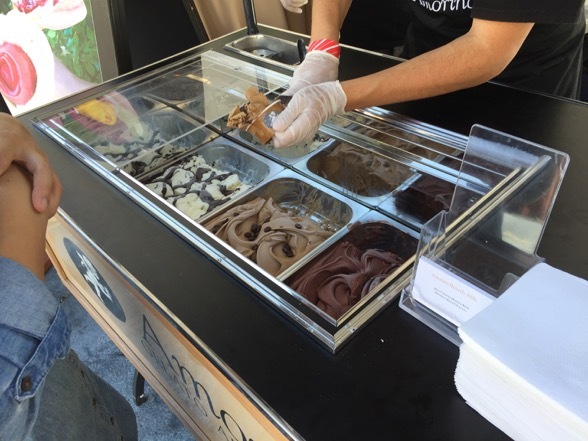 Next stop: gelato! 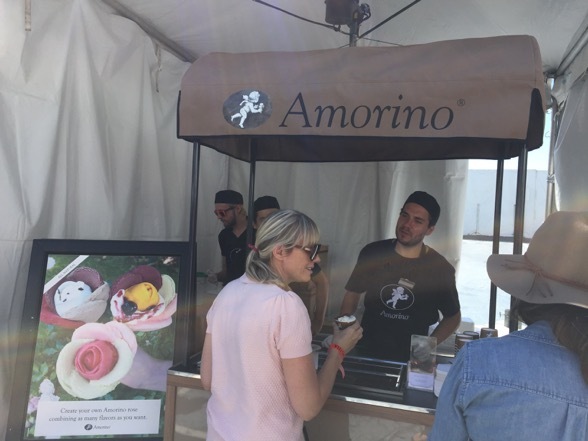 Amorino provided me with a glorious combination of chocolate, coffee, and stracciatella, which is essentially a much better version of chocolate chip ice cream. 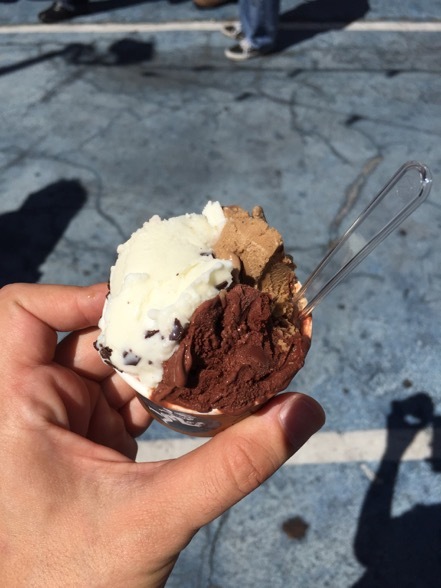 Aforementioned gelato combo, rapidly sublimating into gas under the blazing hot sun. 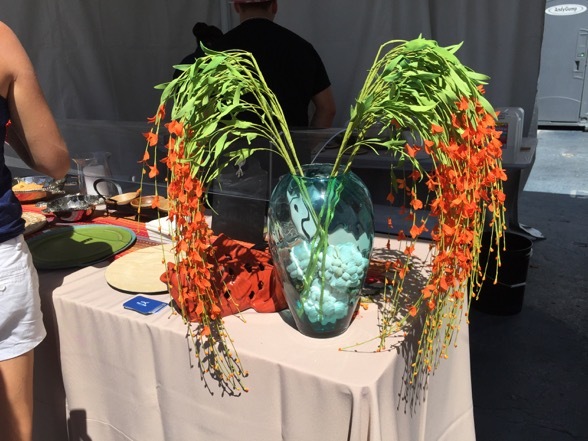 Pretty flowers at the Coni Seafood booth. They look not unlike the sweat pouring off my face. 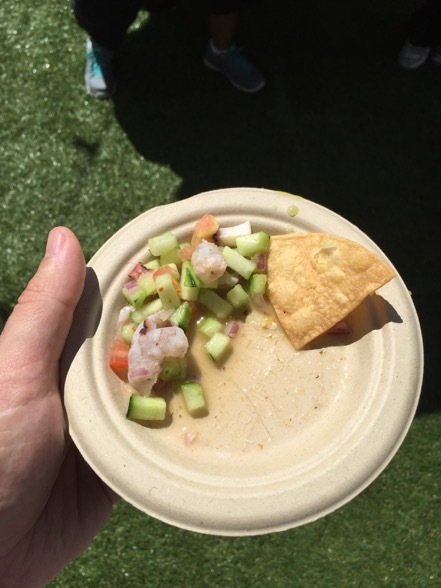 A reliably lovely ceviche from Coni Seafood. One of my favorite restaurants in LA, I should add. 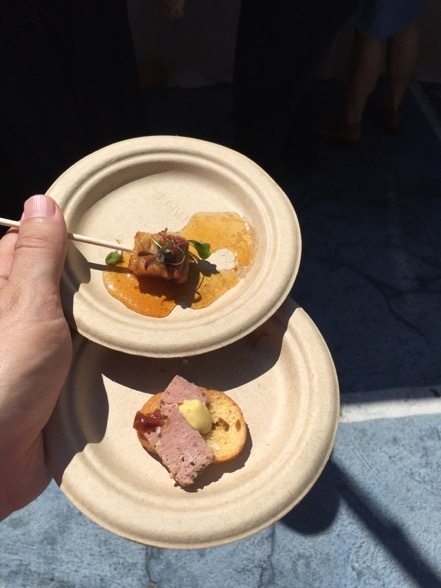 The Spare Tire Kitchen served up this decent pâté and melt-in-your-mouth pork belly. For those of you keeping score, my eating experience has been in this order: Bloody Mary, ensaymada, gelato, ceviche, pâté, pork belly. Killing it. And here we are at DogHaus, my favorite hot dog purveyor in Los Angeles. I bow down at their altar of Hawaiian Rolls. Today’s offering: some devilish bite called Chili Con Corny. 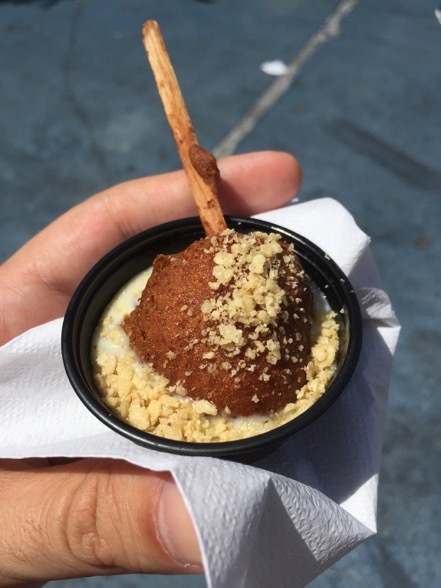 If I were ever stranded on a desert island with this bite and then befriended it in a dehydrated state of lunacy, would I be allowed to name it the Chili Con Corny Wilson? 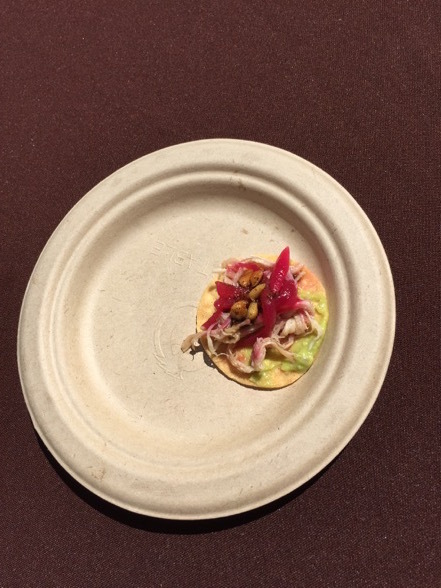 Well look at this darling bite from Petty Cash Tacqueria. Lovely. Why didn’t I go back for seconds and thirds? I blame early onset heat stroke. 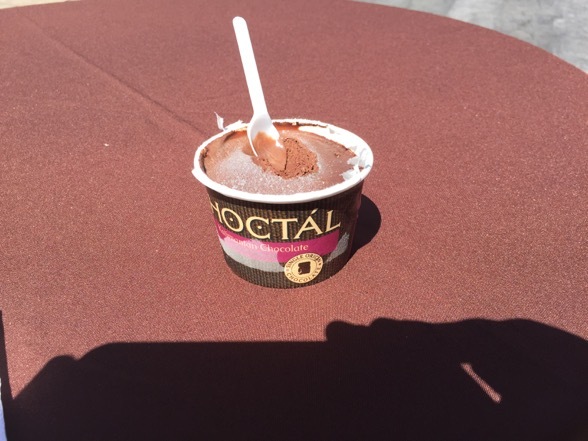 Last year when I went to The Taste, I encountered Choctál ice cream, and I merely wrote “I found a lone ice cream vendor in Choctál, which offered dark chocolate Dominican ice cream.” Let me revise that. This is some of the best commercially made chocolate ice cream I have ever had. So deeply chocolatey I could cry. 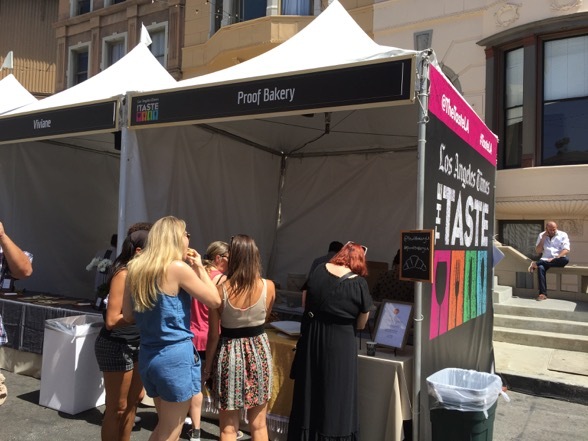 I wanted to try all four chocolate flavors they had, but I needed to save room for the rest of the festival. However, the one flavor I did try, Kalimantan, was divine. 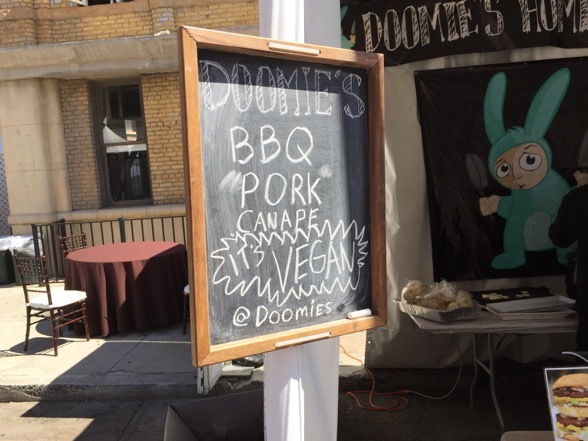 My friend Eric has been exploring veganism of late, and I learned about Doomie’s through him. 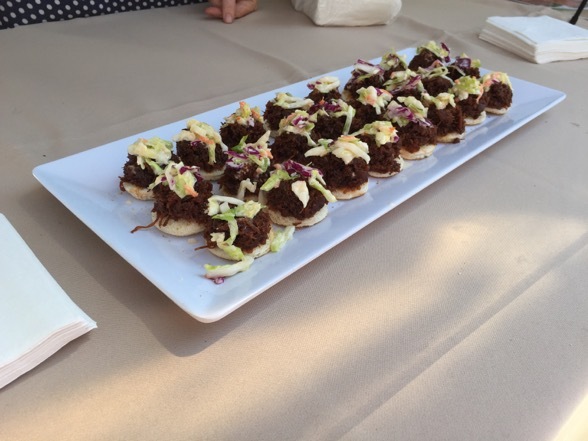 This was my first time eating their food, and I will say that their BBQ Pork Canape was delicious! I may just have to plan a visit to this TEMPLE OF DOOMIE. Last year, Asian Box impressed me greatly with their offerings. 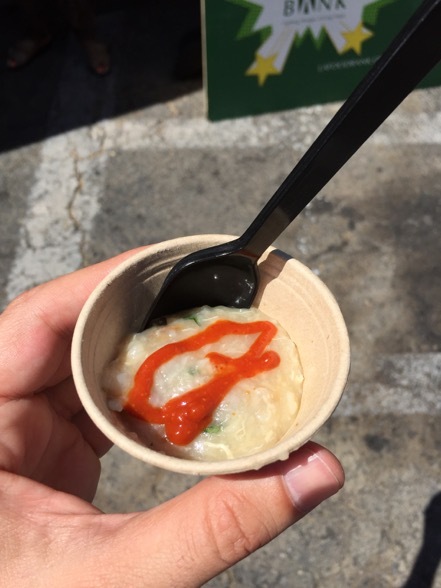 This year, I still have no idea what Asian Box actually is, but I again really enjoyed their chicken porridge with homemade sriracha. The first spoonful was fine, and by the end, I was scraping the little cup. And so ends another compelling episode of Ben & His Porridge. 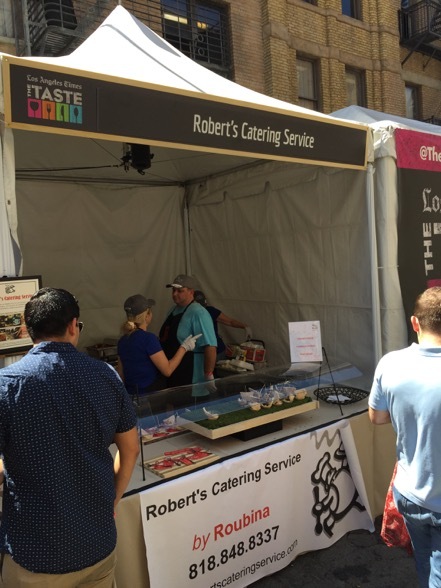 When I dropped by the booth for Robert’s Catering Service, I have to admit I wasn’t expecting much. 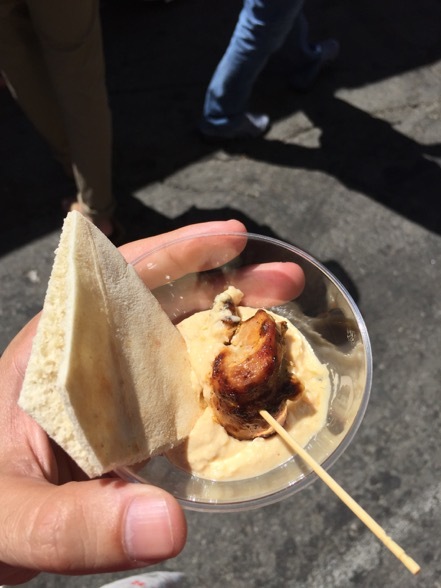 Maybe it was the generic name or the rather ho-hum “chicken kebab & hummus” offering. Then I ate the damn thing and decided that it was in my top three of the entire morning. Loved it!! 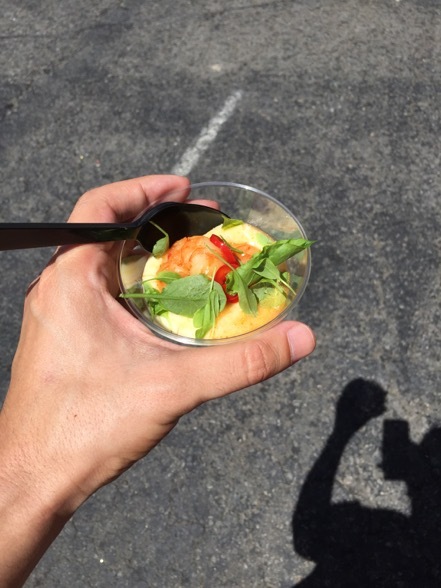 I will never cast a snap judgment again, Robert’s Catering Service. 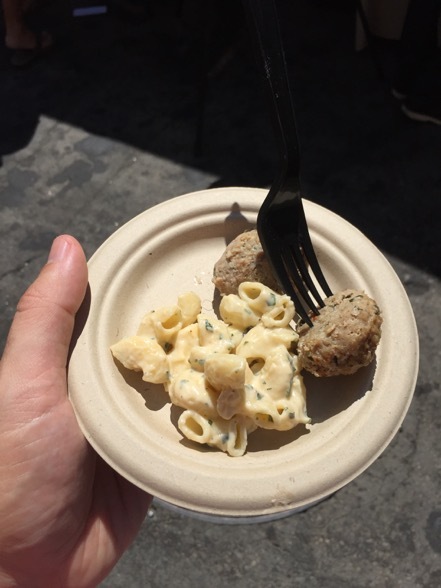 Basil mac & cheese and turkey meatballs from Comfort Kitchen. When I arrived, their staff was in the middle of congratulating themselves for “killing it.” So, that was exciting for them. Shrimp and grits from The Front Yard. Delicious. Although, I just went to the restaurant’s website, and I’m FURIOUS that this is not available on their menu. FURIOUS, I SAY. My beautiful colleague Katherine Spiers insisted that we class up the joint with her manicured fingers. I think it was a good decision. Also, she gave me seeds from local broadcast channel KCET (or should I say, K-SEED-ET. Proof Bakery. All I have to say is… y’all. Y’ALL. But it did, IT DID. 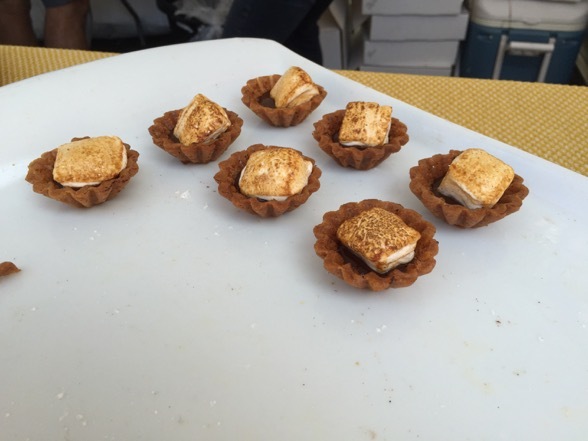 These s’mores cups were the single best thing I had all morning. Perfectly toasted marshmallows sitting in a little puddle of the most deliciously dark and wonderful chocolate — is it any wonder that I had about six of them? 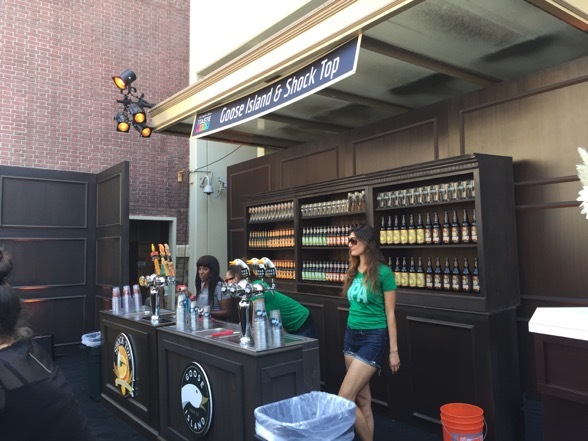 A random shot of the Shock Top bar. The good people of Ocean Prime Beverly Hills. Not going to lie: I only took the pic because they were so good looking. 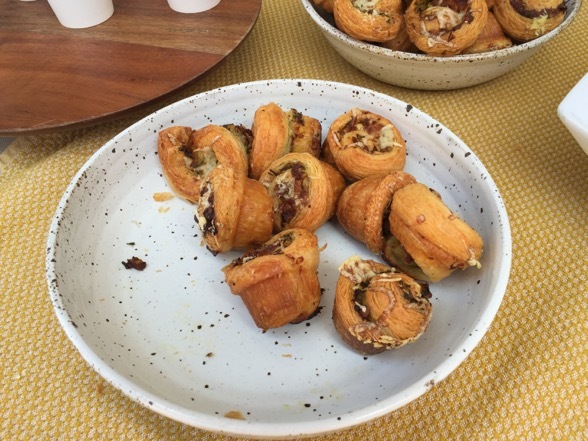 This entry was posted in Food, Los Angeles, Out & About and tagged Choctál, food, Los Angeles Times, Los Angeles Times The Taste, Proof Bakery, The Taste by Ben Mandelker. Bookmark the permalink. 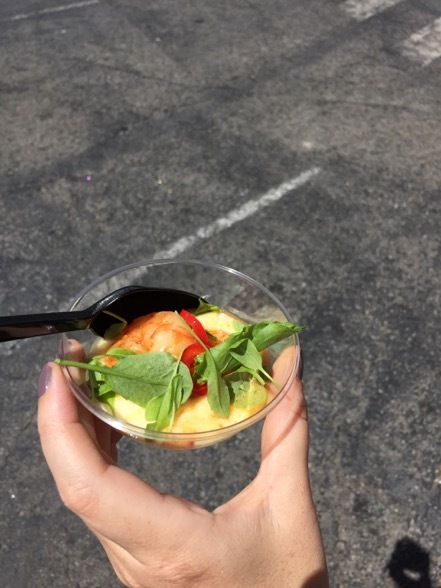 We put the shrimp on grits on the menu the weekend after the taste! 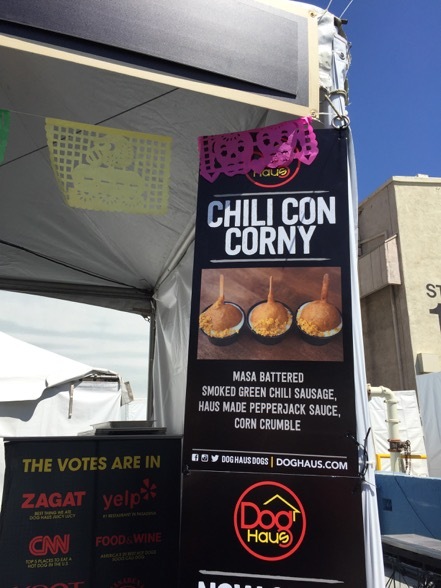 Feel free to come by and try them at home base!